Thanks to NetGalley and Thomas and Mercer for the ARC of this book. 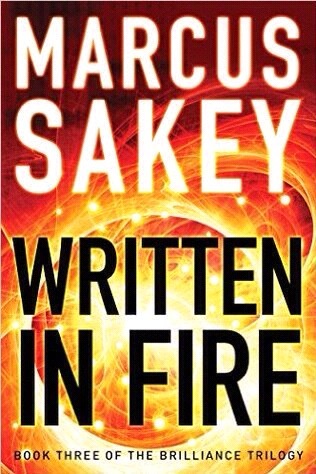 ‘Written in Fire’ is the third part of Marcus Sakey’s Brilliance trilogy. I’d listened to the previous two books as audiobooks as they are available free through Amazon’s Kindle Unlimited. I read the final part as an ebook and didn’t really enjoy it as much. I think this sort of thriller writing is better suited to being listened to in the background than having to give your full attention to it. It took me three months to plow through this book; I kept finding my attention drifting whenever I tried to pick it up. That said I did want to get to the end and find out how it finished. The Brilliance trilogy is set in a world similar to Heroes or the X men where some people have evolved to have special powers. However, their powers are less glitzy then other examples of this genre. ‘Brilliants’, as they are known, can do things like read peoples’ intentions, move without being noticed, weigh up the probability of occurrences or plan strategically really well. There’s no flying or time travel or anything really far-fetched. Due to the fact that their powers are quite subtle or ephemeral it makes it quite hard to imagine how the powers work and how useful they would be. In the final part Nick Cooper, the hero of the trilogy, barely uses his power, which is reading intentions, to the extent that you can almost forget he is different. I thought Sakey dropped the ball a bit in terms of his characterisation in this final book. The trilogy covers the tensions caused by Brilliants co-existing with normal people, which results in a bit of a civil war in this book. This premise can never really be resolved because even if you stop the war there are still going to be two groups of people and tensions will arise. Therefore, even though the trilogy ends, the story can’t really conclude and does end on a fairly predictable cliffhanger. I didn’t find the conclusion all that convincing, Sakey raised the stakes really high and then seemed to solve the problems he’s created too easily. I also didn’t like the lead character’s dual love interests with his ex wife Natalie and new love Shannon. The fact that he didn’t just pick one woman and stick to her made his character more wishy washy and the tension that this scenario could have built was never paid off. Both women are supposed to be strong and admirable but they seemed perfectly happy to be strung along by a man openly sleeping with two women. It didn’t ring true. I’m glad I finally made it to the end of this book and this trilogy but I can’t say I really enjoyed the experience of reading the final book. It probably would have been better as an audiobook or as a film or TV programme.